Julian Assange ... was the subject of Australian intelligence reporting last year. 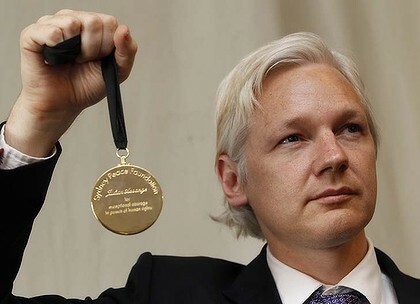 THE department of the Prime Minister, Julia Gillard, has revealed that WikiLeaks and its Australian founder, Julian Assange, were the subject of Australian intelligence reporting last year as the government anticipated the whistleblower website would spill "highly sensitive and politically embarrassing" Australian secrets. Officials also feared that WikiLeaks could publish information from the Australian Security Intelligence Organisation. However declassified official briefings do not support Ms Gillard's public assertion that Mr Assange broke Australian law by publishing leaked US government secrets. Confirmation of Australian intelligence reporting on WikiLeaks comes as the government moves to broaden ASIO's ability to spy on Australians involved with activities outside Australia. Last December the Herald published a series of stories based on leaked US embassy cables provided by WikiLeaks that revealed highly critical US assessments of former prime minister Kevin Rudd, Senator Mark Arbib's confidential contacts with the US embassy, secret Australian government concerns about the war in Afghanistan and other issues. The Herald has secured the release under freedom of information legislation of more than 260 pages of secret AUSTEO (Australian Eyes Only) prime ministerial briefs, situation reports and other papers. The papers show the government went into crisis mode after the US government alerted Australian officials on November 24 about WikiLeaks's prospective publication of US cables. The Secretary of State, Hillary Clinton, subsequently contacted Mr Rudd on November 25 to express her deep regret that the material had been leaked. The first meeting of a top level interdepartmental committee on WikiLeaks chaired by the deputy National Security Adviser, Margot McCarthy, took place on the morning of November 25. Senior officials immediately noted the potential for disclosure of "highly sensitive and politically embarrassing matters". Later that day Ms Gillard was told that efforts were being made to "gain firsthand access to the cables to conduct our own analysis". However the secretary of the Department of Foreign Affairs and Trade, Dennis Richardson, told a Senate estimates committee in February that it took "a frustrating amount of time" before US officials provided a detailed briefing and that Australia was ''spectacularly unsuccessful'' in obtaining copies of the cables from the State Department. Ms Gillard was briefed by her department at least eight times before the first exclusive publication of Australia-related cables by the Herald on December 8.